IT's bento, in the box are onigiri, chicken yakitori, pork rolls, strawberries and blueberries. 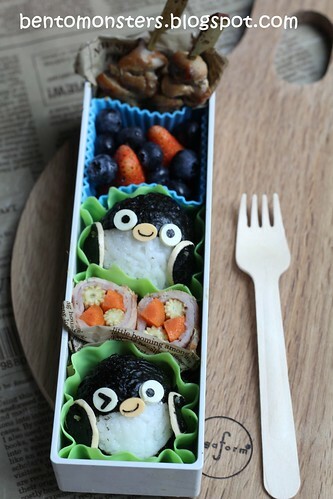 LT's bento, same food as above. 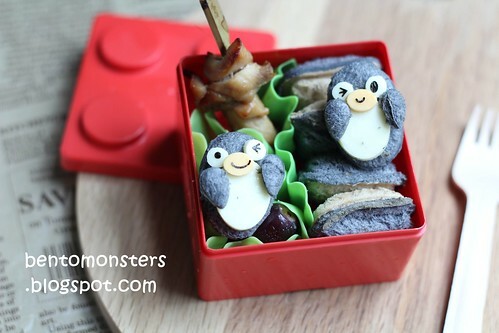 IT's bento for recess, in the box are nutella sammies, chicken yaktori and grapes. No box for LT to bring to School today. The fussy boy insists that the charcoal bread does not taste good, even though it taste just like normal bread. -_- So, I did not bother to make him a box. Everything looks beautiful and of course delicious!! I'll take LT's charcoal bread in a skinny minute! It's so funny how if the child get something in their head, there's no moving these tiny little minds! Missy Lulu is so like that. The chili prawn is making me drool now! Awww, I love the cute penguins and how nicely they fit into the boxes:) N loves penguins and lately into The Club Penguin games. Did you make the charcoal bread, I never seen it before? Tks 4 ur sweet comment, Rina. :) No, I did not, I bought it at a bakery opposite my hse. It's the first time I've seen it here. I did saw it b4 at a famous bakery chain in Malaysia. Wow, those Penguins are wonderful! 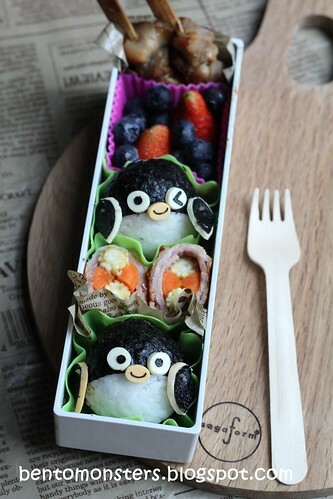 I will have to try making Penguins in my bentos now. I sometimes get stuck with creativity because I think if I don't have a certain shaped cutter then I can't make it. 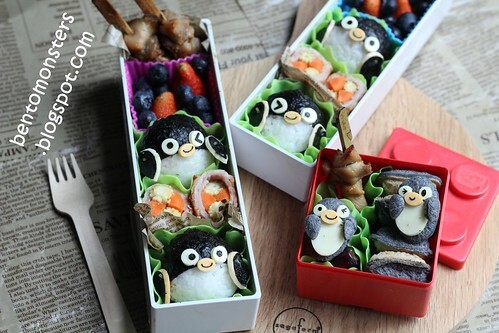 Cute peguins! My boy won't take charcoal bread too.. Maybe due to the colour instead of taste.. But does charcoal bread has more nutritional value than normal breads? Tks, Bobo! Yup, I think so, guess he subconsciously feel it's not nice due to the colour. He did finish it at hm if I feed him, but he wun feed himself, so can't pack 4 sch. I dun think it has more nutritional value, but I read b4 it has some health benefits like lowering cholesterol, killing bacteria, etc. Those penguins are amazing! 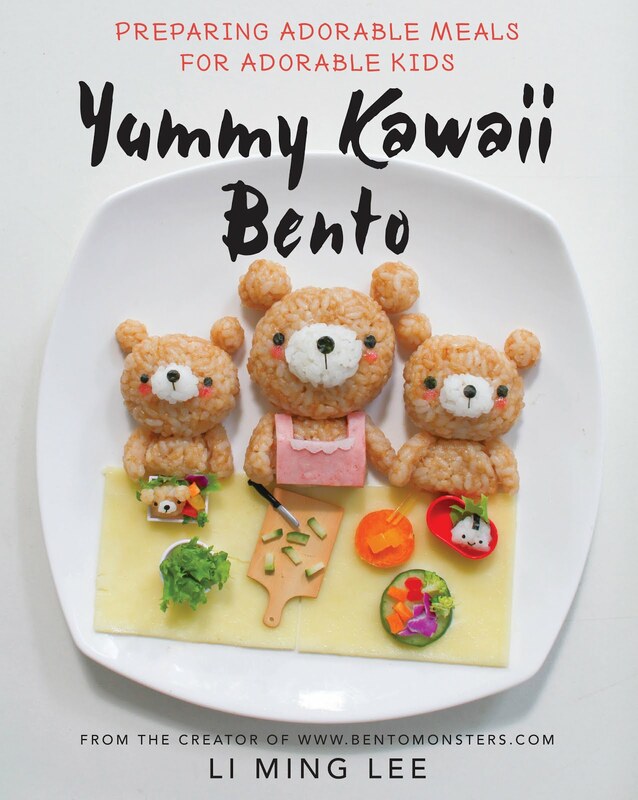 What beautiful bentos! What is charcoal bread? Sounds interesting! Awwww... I like this penguin! So cute!!! Maybe I shall try with bread ball as I havent try to do bread ball yet! Lol, yah, taste exactly like white bread! Lol, guess they can't get over the colour.